I came across this coin by accident when I was visiting my friend in Brington, England. While checking the coins after we got back from shopping, I noticed a dull-looking coin and upon closer inspection, I knew instantly that I have in my possession a counterfeit coin that I had previously read about. The die is quite weak, hence the poor quality strike on both side, making the appearance looks dull. The coin rims look uneven. The inscription "IRB" beneath Queen's neck is not readable. The milled effect on the side looks uneven and the overlapping lines also look uneven and have an "extra" while the dot, was not really circular. Weight, unknown. Metal is presumably brass. Obverse: Rank-Broadley head, inscription ELIZABETH II D G REG F D 2004, starting from below, IRB directly under the bust. Encircled by dots. 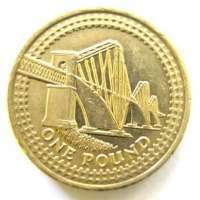 Reverse: Forth Rail Bridge, ONE POUND below. Encircled by a railway line. Edge: Two overlapping lines, one curved and one angular. 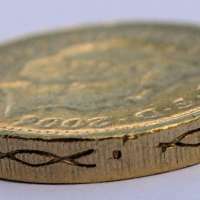 A survey by The Royal Mind (April 2012) indicated that the £1 coins in circulation at the rate of 3.09% and has been on gradual increase up from 2.94% in its previous survey. Around 44m fakes are in circulation. According to the same source, features of counterfeit coins to look out for are set out below. The date and design on the reverse do not match (the reverse design is changed each year). The lettering or inscription on the edge of the coin does not correspond to the right year. The milled edge is poorly defined and the lettering is uneven in depth, spacing or is poorly formed. 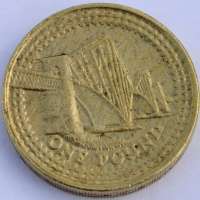 The obverse and reverse designs are not as sharp or well defined. 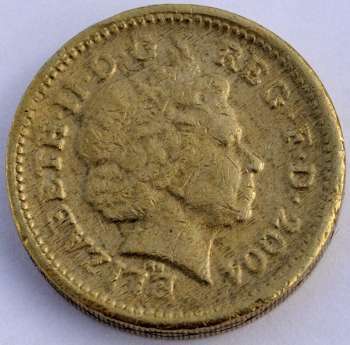 Where the coin should have been in circulation for some time, the colouring appears more shiny and golden and the coin shows no sign of age. The colour of the coin does not match genuine coins. The orientation of the obverse and reverse designs is not in line. I have 1 also. its look like it. Give me some information related to it. This is a forgery copy. So, other forgery may look different than this one.